Many people are under the mistaken impression that wheelchairs are only for people who cannot move about any other way. This could not be further from the truth. Transport wheelchairs can be of great assistance in many ways such as wheelchairs for post knee surgeries or someone who needs wheelchair assistance in the shower. A lightweight transport wheelchair differs from a standard wheelchair because they are made of light weight materials, are narrower, easily maneuvered, can weigh as little as 14 pounds and cost as little as $100. Who Can Use Transport Wheelchairs? Persons who suffer from breathing problems or diabetic neuropathy will find a lightweight folding transport wheelchair a great blessing when shopping, for doctor’s visits and even visiting with friends and relatives. The elderly, who may still have few problems walking with a cane or medical walkers, will feel much more secure in outdoor environments when seated in a lightweight transport wheelchair. The addition of a wheelchair cushion and carry pouch increases the freedom and enjoyment of mobility. These wheelchairs can even be of great use inside the home for persons recovering from a broken leg or knee surgery, permitting greater mobility without fear of falling. All transport wheelchairs are equipped with brakes for safety and will easily support 300 pounds. Most people will rent a wheelchair after an accident but those initial costs can easily surpass the better option of purchasing a new transport wheelchair. It is hard to pinpoint how long rehabilitation can take and so it is better to have one on hand permanently. Self Transport and Foldable Wheelchair with Detachable Parts – These transport wheelchair armrests can be lowered and cleared for easy handicap transfers. The user can transport themselves in this wheelchair if they so choose. With a sturdy frame, adjustable elevating footrests, ability to handle weights of 300lbs, detachable armrests, fits in the trunk of a car and can fit through most standard hallways, this self transport wheelchair is a good buy. 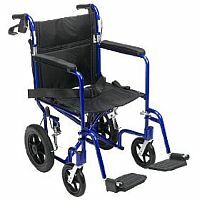 Blue Transport Wheelchair with Brakes – This folding transport wheelchair is highly rated and has the most user reviews and opinions. It is very easy to push around and has brakes to hold the wheels in place. This is one of the best lightweight transport wheelchair that weighs 23 lbs. This transport chair works best for individuals smaller than 250lbs. 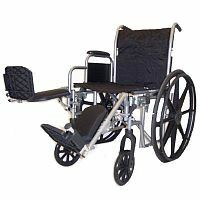 Lightweight Steel Transport Wheelchairs – These all purpose transport wheelchairs are lightweight (weighs 33lbs), comes equipped with seat belts, 8 inch wheelchair casters in the front and rear, and has a swing away footrest. Comes in 17 or 19 inch seat widths. For even more comfort and security, a heavy duty transport wheelchair, with a seating width of 22 inches wide and 18 inches deep may better suit your needs. This type of chair will support 400 pounds, have a steel frame, leg and foot support plates that are removable and arm rests that can also be removed or swung out of the way to more easily permit the transferring of wheelchair users to another seat. This heavier duty style is foldable for storage but is heavier to lift, at 41 pounds, because of the sturdier construction. So if you are looking for a 400 pound transporter, this wheelchair transporter can be found for as little as $200 online. Bariatric Folding Transport Wheelchair with Wide Seats – Handles 400 lbs and is foldable. This heavy duty chair is not the prettiest one available but with a seat width of 22 inches, it gets the job done. Most transport wheelchairs are under 30 inches even the ones made for larger individuals. Because the Americans with Disabilities Act has mandated that all passages be at least 32 inches wide, these transport wheelchairs are extremely easy to maneuver in public places, as well as inside the home. 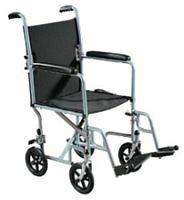 With the variety offered, it is a wise decision to have one of these wheelchairs on hand, for your own possible needs, or to facilitate the comfort of guests to your home. Choosing a quality folding transport wheelchair will permit it to be stored in very little room and the cost is certainly affordable. At one time or another, most families will find that having one of these chairs on hand to be very convenient.